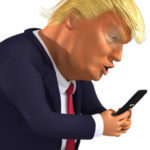 Even as Donald Trump’s fans were busy mistakenly celebrating an imaginary victory regarding Special Counsel Robert Mueller’s Report, Trump himself decided to simply go quiet. Then he stayed quiet. Then it became a joke about how long he’d been quiet. This morning, after a blissfully silent thirty-nine hours, Trump finally lit up his Twitter dumpster fire again – except he didn’t. This morning at 8:01am, Donald Trump tweeted “Good Morning, Have A Great Day!” Then just one minute later, he tweeted “MAKE AMERICA GREAT AGAIN!” Here’s the thing. Based on the tone and phrasing, Trump clearly didn’t write that first tweet. That means he wasn’t behind the followup tweet either, which came just sixty seconds later and was clearly posted by the same person who wrote the first tweet. That’s right, it wasn’t even Trump yelling his signature xenophobic catch phrase. These two tweets are generic nonsense, but they do give something away: Donald Trump still doesn’t have anything to say. His handlers clearly became concerned about all the attention his prolonged silence was receiving, so they tried to make those headlines go away. The trouble is that they initially did it with a tweet that sounded nothing like Trump. It makes you wonder who on Trump’s team did write that first tweet. In any case, we now know that Donald Trump’s silence isn’t some kind of strategy whipped up by his handlers and impressed upon him. No, he just doesn’t know what to say as he awaits the Mueller report, which he knows likely to expose just how much of a criminal he is, and just how thoroughly he didn’t legitimately win the 2016 election. This gives away that Trump is indeed scared into silence – to the point that his handlers felt compelled to try to clumsily cover for him.